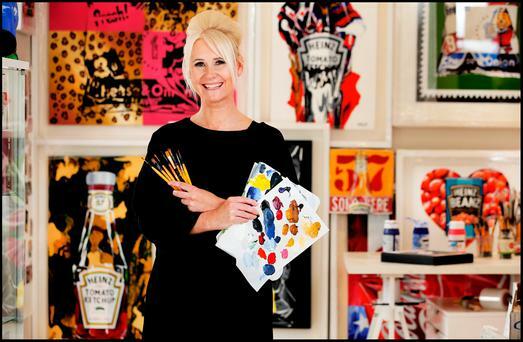 The mistress of Irish pop art is busying away between her palatial kitchen and its adjoining studio. Her paintings are everywhere – a string of bright red chilli peppers, a bowl of bright green pears, a crushed Coca Cola bottle – and here and there lie stacks of prints, bubble-wrapped and ready to dispatch to buyers. On the walls are Heinz ketchup bottles, Tayto packs and those near-extinct telephone boxes – the totems of Irish nostalgia that have been her making as an artist. She has always worked from home and it’s impossible to divorce her art from the pleasing circumstances in which it’s made. Arriving at the Foxrock address, electric gates yield to a big white turreted dream house. Walsh, an ageless 40-something, dressed in cool black combats with designer tears, her platinum blond hair in a beehive, diamond earrings twinkling, brings me over a chessboard floor, yappy little dogs at her feet. She has three daughters, but where is all the household detritus? There isn’t a speck – except for the empty packets on the walls, if you like. A lofty kitchen – all cream and granite, with brickwork around the Aga, hanging baskets of candles, a battalion of wine bottles looking out from one cabinet – leads onto the neatest studio in all the world; stacks of paintings ready to go, the tips of brushes pointing up from jam jars, everything as it should be. Things are very perfect in this locale, not least of them Walsh, a gorgeous person, who says “I’m a bit of a neat freak,” and describes painting and drawing as one of her “guilty pleasures”. She serves coffee with hot milk and fresh scones with jam. The butter comes in a retro sardine tin – there are old-fashioned biscuit tins all over, next to Patricia Scanlon and Anne Enright on the bookshelves. I’m hoping there might be one of those red weather warnings and I’ll be given the spare room for a few days. She is warm-hearted and cheerful, and talks a lot, but without much tendency to promote herself, to gild the lily. She is an adoring mum, you can see, when one teenager comes into the kitchen looking for a snack. One of those few people who found what she was destined to do only after she had children. After leaving NCAD, Walsh gave up her brushes and trained to be a graphic designer, working on her Apple Mac. Then came that golden opportunity to paint. Her first pieces were of teddy bears, prams, nursery rhymes, on fine paper soaked in tea, with gold writing and burnt edges, and it wasn’t long before a gallery in Blackrock took them on. But her self-confidence wavered. She recalls being “too embarrassed” to go in and speak to the gallerist herself, waiting outside with the buggy while her husband went in on her behalf. But this didn’t stop her painting like crazy, “strings and strings” of chilli peppers at home in her kitchen – in the bold primary colours that are still laid thick on her palette today. They were “an instant hit,” selling for about IR£500 each. Then came the lady that changed everything for the painter. A friend had commissioned her to paint the Heinz ketchup bottle as a wedding present for a “mate who loves ketchup”, but the commission fell through. She still had six paintings of a half-empty Heinz bottle to sell, and she was standing by these when a corporate lawyer from Heinz came up and told her she was infringing copyright. The lady went away, came back and said that in fact Heinz wanted to buy the whole series of Heinz paintings to hang in their headquarters in Pittsburgh. “She was a fabulous girl,” Walsh muses. Look around, and you see Heinz ketchup on the walls, while a glass cabinet holds mugs, tea towels, aprons, napkin dispensers, fridge magnets, mouse pads. All splashed with the fresh blood of Walsh’s ketchup colours. She worked on an advertising campaign for Heinz and, since, the condiments giant has commissioned her to do the artwork on their merchandise. The Heinz offices in Poland are wallpapered with her work. “They’re a wonderful company. Very, very good to me,” she says. More branding work hangs in Converse Ireland and Tayto Park. The success that came to her thus involved a little corporate bankrolling, but also a lot of genuine encouragement from a public hungry for mementos of a more innocent time. “I wanted to do something uniquely Irish. The amount of nostalgia people have for Tayto is incredible,” she says. Irish emigrants abroad have a particular fondness for her work, which hangs in homes from London to Australia and the US, South Africa, Hong Kong, Singapore. People tell her stories about when they ate their first bag of Tayto crisps. Why is it, when Tayto and Heinz haven’t gone anywhere, that people are nostalgic for them? “It’s a childhood thing,” says Walsh. “Kids’ parties, St Patrick’s day. The parents go into the pub and come out with the TK and the crisps. “Remember!” She laughs. “Years ago if you put a Tayto bag towards the fire, it shrank completely into the tiniest little perfect Tayto bag, and you could make them into badges… so that was incredible. She bakes fresh cakes in her Aga, but she paints Mr Kipling’s Battenberg. She tells me that Andy Warhol ate all of the Campbell’s soup out of the tins that went in his paintings. “It’s just the design…I just fell into pop art,” she says. Then, she continues, “When I go to bed, I will dream away to my heart’s content about what I’m going to paint the next day. In the middle of a painting, I finish it in my head. I always know what the end piece is going to look like. I lie there and ideas will come to me. “I know I have so much more to do. My head buzzes with ideas, and I just feel I can’t get it all down on paper, on canvas at the moment. There’s a huge amount being pulled back. A lot of time I just feel I’m fitting it in, fitting it in. I feel like I’m being dragged back.” She heaves a deep sigh that ends on a tinkling laugh. As an artist, she says, “I feel I’m only tipping the iceberg, I feel I haven’t evolved at all. Her original paintings sell for about €2,100 from the galleries; more manageably, prints range from €59 to €150. But commercial success is not enough for her. “I don’t think I will ever say that I’ve ‘made it’,” she says. “I’ve been extraordinarily lucky in the projects I have worked on, and the people who have bought my work.” These “people”, I’ve heard, include Colin Farrell and Graham Linehan, but she goes mute, blushing, when I ask her to drop a few names. “I just feel like by saying them… I’d hate someone to think I was trying to use their name or have their name bandied around.” Later, she says that some “A-list” celebrities in the Hollywood hills, and some of Ireland’s “biggest sports stars” have bought her work. But she’s loyal to the end: she won’t say who. Her next big exposure to the public will be at House 2018 – a high-end interiors event presented by INM, publishers of the Irish Independent, at the RDS next month – where her exhibit is sure to be the big attraction in the Art Loft. She is exhibiting her original pencil drawings of Tayto bags for the first time, among other pieces of pop art. These days, the old terror at facing the public has given way to “butterflies”, and then she moves on to the next thing. “You do an exhibition, you’re forgotten two days later. You have to keep going, keep people interested,” she says.